Unlike a traditional jewelry store, secondhand dealer or pawnshop, Ideal Luxury will consult with each client in a discrete manner from the comfort of a private business office. There are no gates to get buzzed though or lines to wait in. Whether you are buying, selling or getting a loan on that special Rolex watch or Tiffany & Co. diamond earrings, just think of us as your luxury concierge. If you can’t make it in person, please call our toll free number (888) 505-5505 to discuss your needs with one of our professional consultants. 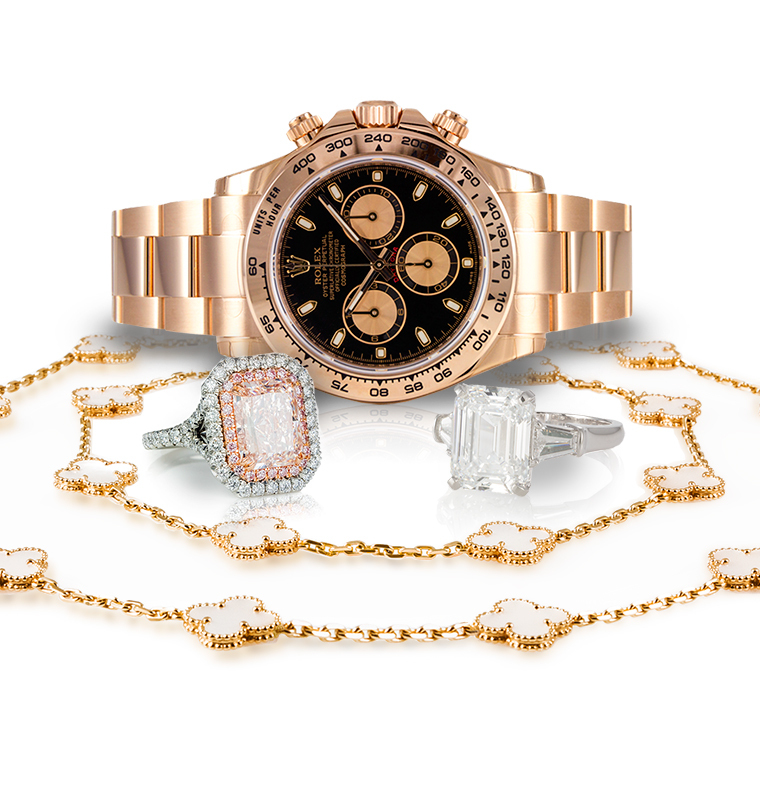 Ideal Luxury was founded in 2013 by Mark Schechter, an established retail and internet based luxury pawnbroker. Mark’s fascination for watches and fine jewelry came from watching his parents exchange such gifts when he was young. This fascination later grew into a passion for the finer things in life. After graduating from the University of Southern California and more than 20 years in the corporate world, Mark partnered with the successful entrepreneur in his dad to pursue their passion for fine watches, diamonds and jewelry together. Their complementary skills and common passion were the foundation for their popular Southern California based luxury pawnshop. Why introduce Ideal Luxury? Mark’s vision was to integrate the Jewelry-N-Loan model for buying, selling and lending on luxury goods with the privacy, service and discretion typically associated with a luxury resort concierge. Regardless of the business you are conducting, it should be kept private and tailored to your individual needs. This can only be accomplished one-on-one in a private office environment. The best part of this ideal approach is Mark gets to combine his passion for helping people with his love for fine watches, diamonds and jewelry one client at a time. With this vision as a foundation and Mark’s hands on leadership, Ideal Luxury has established itself as a trusted resource in the community providing world class service and a personal touch for all of your luxury watch, diamond and fine jewelry needs. Ideal Luxury specializes in luxury watches, large and rare diamonds as well as fine jewelry. Premium watches from Rolex, Patek Philippe, Cartier, Breitling, Panerai, Omega and many more. Large and rare diamonds, such as D / Flawless and fancy colored gemstones, certified by the Gemological Institute of America, GIA. Fine pre-owned jewelry from Tiffany & Co., Cartier, Chopard, Graff and other world class designers. GIA certified diamond engagement rings and wedding bands without the high prices typical of retail jewelry stores. Custom designed jewelry made from the finest materials to your exact specifications. You do not have to sacrifice carat size, gem quality or craftsmanship to get the perfect piece. Ideal Luxury is proud to offer you the best price if you are buying that special piece, the most reasonable offer if you are selling it, or the easiest process and most attractive terms if you are taking out a short term loan against it. We are able to do this quite simply by maintaining a low overhead and offering world class customer service, one client at a time by appointment only. If you become an expert in your field and listen to the needs of your clients, you’ll find it easy to satisfy them and yourself. Be honest and forthcoming, the truth always comes easy. Do exactly what you said you would do, very few competitors will. Worker harder than everyone else to satisfy your clients. Don’t take yourself too seriously; we’re not saving lives here. Ideal Luxury specializes in fine, pre-owned watches from prominent makers like Rolex, Cartier, Patek Philippe, Panerai, Omega, Breitling Tag Heuer, and many more. Whether you are looking to buy that stainless steel sport watch you’ve always wanted, or surprise someone with the watch of their dreams we are ready to serve you. If you purchase your watch from Ideal Luxury, you get the added benefit of our guaranteed service and support. Our full-time Master Watchmaker ensures that all of our timepieces are in excellent condition. All watches are guaranteed to be authentic and come complete with a 2-year warranty in writing from us for mechanical defects. Let us find the perfect GIA certified diamond and engagement ring you’ve always dreamed of. Do you have your own design in mind? Ideal Luxury specializes in custom designed jewelry made from the finest materials to your exact specifications. You do not have to sacrifice carat size, gem quality or craftsmanship to get the perfect piece. Whether you are getting engaged, celebrating an anniversary or simply want to surprise a loved one with a legacy piece, Ideal Luxury is Orange County’s best resource for large and rare diamonds, fancy colored diamonds and precious gemstones. We have an extensive collection of loose diamonds, precious gemstones and exquisite jewelry. If we don’t have exactly what you are looking for, we have access to some of the finest GIA certified diamonds and gemstones in the world through our coveted network of large and rare gemstone dealers. Mark was very welcoming and gave me a fair price for the ring I had for sale. He put no pressure on me at all to sell it and gave me a few days to even think about it. I ended up selling the ring right then and there. Very professional, I would definitely do business with him again. I went to Mark for a custom engagement ring. The whole process was very welcoming and enjoyable and the ring turned out exactly as I wanted it to, which was amazing to see something from my imagination turned real! I’ve been in to see Mark on a few occasions. Even though I’m selling modest pieces of jewelry he treats it and me as though I were a top rate client. I like the professionalism he always uses when dealing with me and always has an interesting story to tell me too. Great place to go! Wouldn’t trust my business to anybody else!! Send us any questions you may have about our services and products, items you may want to sell or borrow against or any items you might be looking to buy or design. We're here to help!